A survey conducted by Visa Europe in the UK, Italy, Poland and Turkey in advance of the launch has found that 87% of iPhone users would be willing to attach an add-on to their phone in order to make mobile payments. The first commercial deployment of Visa Europe‘s iPhone payments application, which lets customers make payments with their iPhone via the iCarte add-on developed by Wireless Dynamics, is set to go live in Turkey. Yapi Kredi Bank and Turkcell, the country’s largest mobile network operator, are partnering to bring the iCarte technology to market. In December, Avea and Garanti Bank became the first to launch a commercial NFC service in Turkey. The two are using a prepaid MasterCard PayPass service delivered via a Gemalto N-Flex SIM+antenna solution. Customers can use the add-on to make payments in stores and on public transport and to receive digital coupons. The move to a commercial launch in Turkey follows the introduction of Visa’s NFC certification programme in December. Visa Europe, meanwhile, is also continuing to test the technology at its London offices. There, the service is offered to staff via prepaid platform provider FIS and Coventry Building Society. 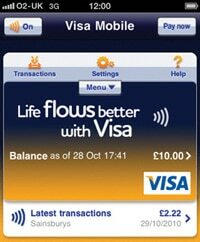 payments by customers,” says Sandra Alzetta, head of Visa Europe’s innovation department. A survey conducted for Visa Europe in September and October 2010 found that iPhone users are more likely to use mobile payment services than average consumers. The survey of 4,200 people in Italy, Poland, Turkey and the UK found that 41% of those questioned said they ‘definitely would’ or ‘probably would’ use Visa’s mobile payment solution. When the question was addressed to iPhone users, the figures increased to 57% percent. The study also found that 87% of the iPhone users surveyed would be willing to use an accessory to allow them to make mobile payments.